Versions of 3D-XplorMath prior to Version 10.7 are incompatible with Version 10.7 (Lion) or later of Mac OS X. This is because they were compiled for the PowerPC chip and Apple removed the Rosetta PowerPC emulator from Lion. Version 10.7 and later of 3D-XplorMath are compiled to run native on Intel-based Macs, so if you are running a current version of Mac OS X you must upgrade 3D-XplorMath to Version10.7 or later. Current versions of 3D-XplorMath will not run beyond Mac OS 10.15. We expect to have a Linux version running by then. Announcement (February, 2019): Version 10.11.1 of 3D-XplorMath is now available from the download page. 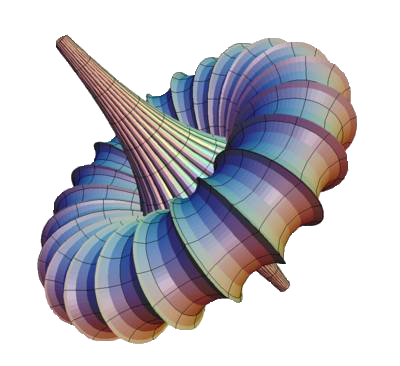 3D-XplorMath is a freely available Mathematical Visualization program. To download your personal copy of the latest version, click on the Download tab above. The older Pascal version runs only on Macintosh computers, but there is also a cross-platform Java version, called 3D-XplorMath-J, and while it has fewer features and Exhibits, we hope eventually to give it all the functionality of its older Pascal brother. The program presents itself as series of galleries of different categories of interesting mathematical objects, ranging from planar and space curves to polyhedra and surfaces to ordinary and partial differential equations, and fractals. Morever, the carefully chosen default parameters and viewing options may be changed by the user so that each gallery is turned into a experimental lab. We have created a series of short tutorial movies explaining various features of the program and also some interesting ways in which it can be used. In particular, you can click here to see a basic introduction to 3D-XplorMath and some of its Exhibits. Another interesting sequence of movies can be found here. These show the time-development of what are called Ward Solitons. Most Exhibits of the Pascal version of 3D-XplorMath have associated to them a so-called "About This Object" PDF file that explains the mathematics behind the pictures. We have collected these files in a hypertext Collected_ATOs for reading and/or downloading as a single inter-linked pdf file. Acknowledgements: The group in charge of the 3D-XplorMath software development project and the related Virtual Mathematics Museum website project is the 3DXM Consortium, an international volunteer group of mathematicians. The Consortium gratefully acknowledges support for these projects by The National Science Foundation (DUE Award #0514781), and thanks the Mathematics Department of The University of California at Irvine, for hosting the 3D-XplorMath and Virtual Mathematical Museum websites. This site is maintained by Richard Palais. Please send me email about any problems you find with it or any suggestions you have for improvements.